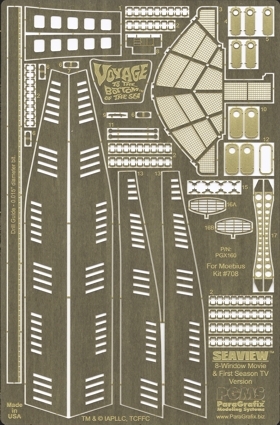 New for the upcoming 8-Window Seaview model from Moebius Models, this photoetch set adds exacting details to an already fantastic kit. Replacement floor for the upper-level of the observation lounge. Accurate raised limber holes based on rubbings from the actual 17’ filming miniature. The little known lower drain holes. The docking cleats seen on the full-sized set. Two different radar dish antennas replicating the studio drawing and the final dish configuration. Tie rods to link the three rudders. The credenza and Seaview display model seen in the observation lounge during the first season of the series. BONUS: A “Voyage to the Bottom of the Sea” medallion that can be applied the model’s display stand.